One of the innocent pleasures of growing up in the pre-Internet 1980s was that there was no easy way of tracking new releases. Now, with so many web retailers offering a ‘pre-order’ opportunity, and advertising their forthcoming wares online, the naïveté of those days has sadly gone. Will today’s generation of younger readers/viewers/listeners ever experience that thrilling mixture of trepidation and excitement that comes out of visiting a familiar store and consulting the racks in search of a new release? I fear not. The half-expectation that went with shop visits in the 1980s is a strong part of me- as much so as the neat run of Doctor Who‘Target’ novels that occupied the bookshelf in my bedroom throughout my childhood- and which occupies it still. Given my nostalgia for the ‘Target’ series, it was a pleasure (again coming out of the casual shop visit) to observe the publication of a splendid new volume celebrating this series which had a crucial role in cementing my own passion for Doctor Who which has stayed with me for well over 25 years. Subtitled ‘A history of the Target Doctor Who books’, David J. Howe’s volume The Target Book charts the development of the imprint from an unassuming South Kensington property into an iconic sci-fi marketing operation responsible for an astonishing 153 novelisations of Doctor Who stories which, when its 21 year reign ended in 1994, had sold an estimated 13 million copies. The Target story is told in a refreshingly unambiguous way- interviews with writers and key Target personnel are interspersed with a narrative that is clear and lively yet knowledgeable. The striking full-colour illustrations that accompany each page are magnificent, and assist the flow of the story whilst also providing a tangible air of nostalgia which practically resonates from the book’s pages. The familiar names- Terrance Dicks, Ian Marter, Malcolm Hulke, Gerry Davis et al- are duly given credit in the unfolding saga of Target, their memories being combined with biographical details that helps situate their writing for Target in historical context. It would be relatively easy, as its story progresses, forThe Target Book to slip into a fan-obsessed study of the minutiae that separated the adaptations from their television equivalent, but it does not do so. Instead, there are intriguing pieces of information (the 1971 television adventure Colony in Space became the more immediately compelling Doctor Who and the Doomsday Weapon by the time Target published its novel three years later, for example) placed back to back with proposed cover designs, text extracts, art sketches, released covers, critical reaction, promotional materials, bite-sized interviews with artists, writers and more. This colourful illustrative backdrop to the ultimately rather sad phasing out of the Target imprint, largely a result of commercial pressures and the changing times, strikes the right balance of celebrating- indeed eulogising- as opposed to mourning. A publisher of books based on a popular science-fiction television series could be considered by some as overly esoteric, but The Target Book is more than this label would suggest. Packed with meticulously researched information and carefully organised high quality visual stimuli, David J. Howe’s labour of love is to be praised for its strong structure and organisation in covering the Target story in every conceivable aspect. It is this framework which enables the reader to follow the story chronologically or dip in and out to read brief features (such as how the Target books were handled abroad or the fascinating stories behind certain novels), which makes the book appealing on two fronts. In a 21st Century world seemingly saturated with glossy coffee-table books The Target Bookis in good company, for it is produced on beautiful quality paper- one of the best I have seen for a volume like it- and is a model of design and clarity. It is hard not to return yet again to the subject of the pictorial content- this is comprehensive and also of the highest production value. 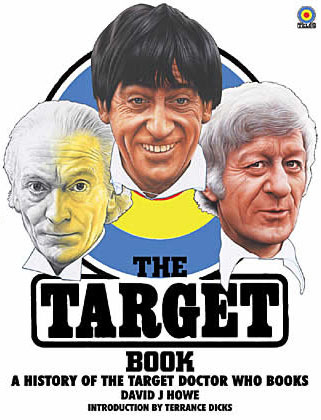 For anyone who remembers the original Target imprint the book should be an essential purchase. For those who are too young to recall the familiar logo and strikingly evocative covers of the novels David J. Howe’s book should still hold an instant appeal- and, it is to be hoped, encourage them to seek out secondhand copies of the original paperbacks…therefore starting the whole process all over again. 'The Target Book' is published by Telos Publishing Ltd.